Nielsen data indicates that Android is the top smartphone platform and Apple is the top manufacturer. In between those data points is a lot of nuance. First, here’s Nielsen’s money graphic. There’s a toss-up between integrated and partner-based platforms. The smartphone industry is often compared to PCs in the early days. Once upon a time, Apple controlled hardware and software. Microsoft partnered with OEMs. Microsoft won that market share game. So far in the smartphone industry, we have a draw for the most part. Consider that Research in Motion and Apple both control their software and hardware and integrate the two. Combined RIM and Apple have 48 percent of the market. 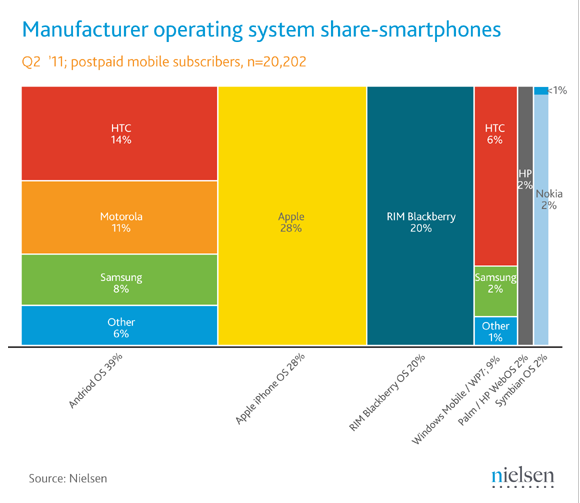 Considering that RIM hasn’t had product on the market for a year that integrated share is impressive. Toss in HP, which controls the WebOS and you have half the market with an integrated system approach. On the partner side of the equation, Android has 39 percent share and Microsoft chips in another 9 percent. RIM isn’t dead yet. Imagine a company that has management issues and a product void that has lasted forever in smartphone terms and still had 20 percent of the OS market. That’s RIM. If RIM’s BlackBerry OS 7 devices can do anything in the market, the company has a shot at being a major player. Microsoft needs more hardware partners. Look at the sliver that is Microsoft’s platform share. Then look at the partners. Microsoft has two friends on the smartphone block—HTC and Samsung. The software giant will need more OEMs if it’s going to compete. Given Nokia is a no-show in the U.S. there are no guarantees that Microsoft’s partnership with Finland’s leading tech company will matter much. Android looks zero sum for hardware players. The Android partners—HTC, Motorola and Samsung—have carved up the market nicely. Unfortunately, it’s hard to see Android doing much better in market share than it is today. That fact means that HTC, Motorola and Samsung are going to wind up killing each other to grow share.